Not every band will stay together for decades, or break up to never be seen or heard from again. Take Failure, the Los Angeles ‘90s alternative rock trio that built an audience of shoegaze and space-rock enthusiasts that found the band a welcome change from the grunge coming out of Seattle. However, like many acts from that Seattle scene, internal turmoil tore Failure apart and in 1997, after just three albums, band members Ken Andrews, Greg Edwards and Kellii Scott went their separate ways. While the trio spent much of the next 17 years apart, the band would communicate during that time over various Failure reissues and the release of previously unreleased demos. Obviously, there was still an external appetite – and an existing fan base – for Failure. Eventually, Andrews, Edwards and Scott mended fences and in 2013 announced that Failure was reuniting. 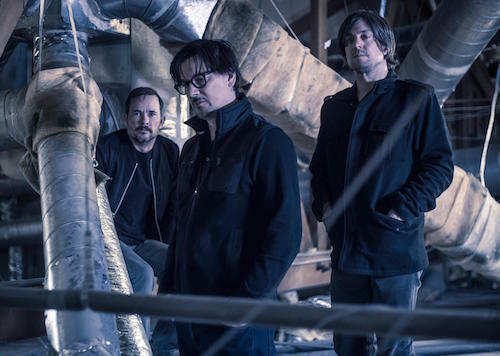 After a successful 2014 club gig in Los Angeles, Failure joined Tool on tour and the rest, as they say, is history. Recently, Riffyou.com spent time with Scott to discuss Failure’s reunion, including what it took to get everyone in the room together, motivations, current relationships and the band’s killer new album, 2015’s The Heart is a Monster. RY: When Failure decided to return, was there ever a concern about if you’d still have an audience out there? RY: That must really stir up some interesting emotions for you guys. RY: Did the idea of Failure reuniting come from you guys, or people around you saying, ‘It may be a good time to come back’? RY: Once you got those personal relationships in order again, what did you guys need to hear from each other, musically, to know that it made sense to do a new album? RY: When you went from those jams to making the album, did you think that you were creating for yourselves, or for the fans? RY: Have you determined what Failure does better now than it did back in the day? RY: Have you guys thought about the future very much and what could be next for Failure? RY: Even with that said, have you determined what you want from Failure moving forward?